Kennedy Center Unveils Progress On New Extension For Artistic Projects : The Two-Way President Deborah Rutter hopes people will come to The REACH for "the artistic experience," but also to be together on the green roof and walking paths. The Kennedy Center is building a new space for artistic projects that it's calling The REACH. Completion is planned for September 2019. The name has been explained as Renew, Experience, Activate, Create and Honor the legacy of Kennedy. Movement is central to the experience the Kennedy Center is trying to achieve with The REACH. Curved walls, light-filled, flexible performance spaces and views of the flowing Potomac River all contribute to the effect. 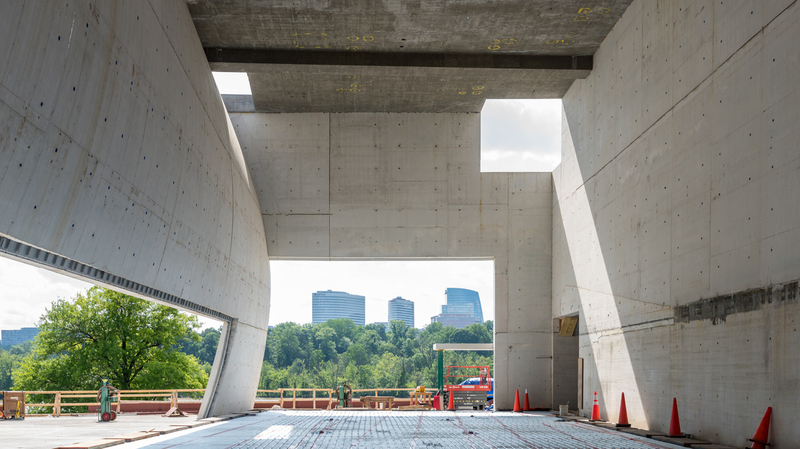 Architect Steven Holl says "the swooping lines" were "inspired by glissando in music," fitting for a campus where professional performers, apprentices, summer campers and audiences will intentionally commingle. Rutter says research shows that people come to the Kennedy Center to interact with one another. "They want the artistic experience, but also spaces where they can be together." Dancers from the Duke Ellington School of the Arts gave reporters on the hard-hat tour an idea of how The REACH will look when it's done. 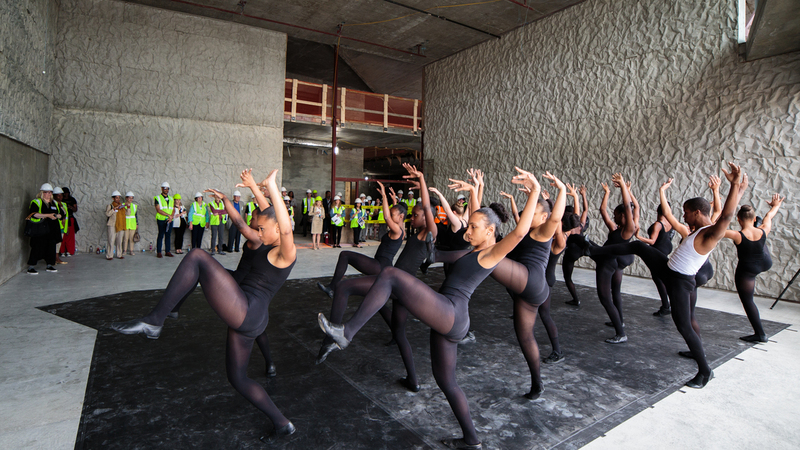 At different spots along the tour, musicians and dancers performed, giving hard hat-wearing reporters a sense of how the spaces will be used. For superior acoustics, theaters and studios have "crinkle concrete walls," that look almost cave-like. Anyone who's been around Washington long enough will tell you The Kennedy Center's original building has been the subject of much groaning over the decades. The 1971 building is an immense, white marble edifice with gold pillars that some have found royally uninviting. Just before it opened, New York Times architecture critic Ada Louise Huxtable said it looked like a "superbunker." She wrote the Kennedy Center was like other monuments in Washington, D.C., a city she said seemed to prefer "the big, the bland and the banal." The REACH is clearly a departure. The Kennedy Center is also difficult for to get to without a car. The expansion aims to change that with a pedestrian bridge that will connect the Center with the National Mall and with other memorials. Rutter wants the federally funded institution to be accessible to as many people as possible, whether they attend a performance or not. She envisions bicyclists taking a break to visit a new 130,000 square foot "green roof" that will include gardens, walking paths and a 35-tree gingko grove. That green roof is still a gray, concrete surface surrounded by heavy construction equipment. The Kennedy Center has raised $170 million in private donations to create The REACH. While showing off the potential of these new, dynamic spaces, the Center also announced the budget has increased to $250 million. In a statement the Kennedy Center says the increase is due to "sustained philanthropic interest in the campaign, ongoing programmatic opportunities, and increased project costs." The REACH is scheduled to open to the public Sept. 7, 2019.